ProGear replacement spindles for Jacobsen mowers are made with the highest quality materials. We provide high quality drop-in replacement spindles for Jacobsen 552189 and all Jacobsen lawn mower spindles. For ordering information please fill out a contact form, email or call 502-689-9455. Fits Bobcat, Exmark Jacobsen, Kees & Snapper 32″ & 36″ cut decks with short shafts. Also replaces outside spindle of Exmark 48″ cut decks. Replaces Bobcat #(s) 36006N; Exmark #(s) 1-302030, 302030; Jacobsen #(s) 552189; Kees #(s) 101455, 362024; Lesco #(s) 050135; Snapper/Kees #(s) 1636104, 2870563, 5-9759, 7-6379, 7059759. Replacing your Jacobsen 552189 spindle is a relatively easy process. While we always suggest relying on your local Jacobsen dealer for service of your Jacobsen spindles, here is a brief outline as to the steps necessary to replace your spindles. Needless to say, you will want to make sure that your mower is turned off with all safety switches engaged before you begin. You should also consult your owner’s manual before attempting any repairs or replacement of parts. Jacobsen 552189 Spindle replacement: (1) Remove the deck from the mower. This will make it much easier to remove the spindle. (2) Remove the blade and the pulley from the worn spindle. You will likely want to repair all of your mower’s spindles even though only one is showing symptoms. By replacing all of the spindles at one time, you avoid repeated down time as spindles separately wear-out over time. (3) Remove the worn spindle from the deck. Exercise care and attention when removing the bolts. Use penetrating oil and let it soak. If the bolts break off you should drill and tap new mounting holes slightly offset from the original holes. 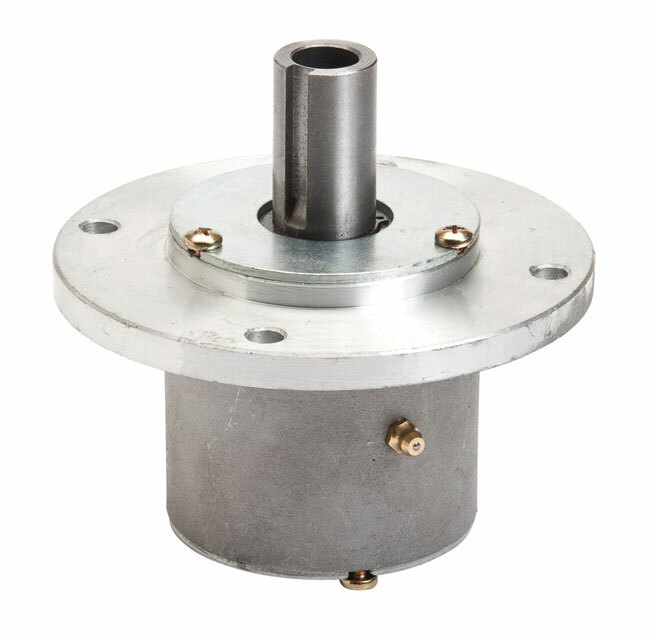 (4) Replace the old spindle with your new ProGear replacement for Jacobsen 552189. With any luck, your new spindle should last three to five years. Jacobsen® is committed to providing high-quality turf equipment to customers around the world. We produce walking greens, riding greens and fairway mowers, as well as utility vehicles, sprayers and aerators. We engineer our products to meet the needs of today’s turfgrass professionals by asking for and listening to their feedback throughout the product lifecycle. Jacobsen provides dedicated support and conducts rigorous testing for quality and reliability. You will find Jacobsen equipment at the finest golf courses and sports facilities world-wide. ProGear strives to provide replacement parts for Jacobsen mowers that are as durable as the original parts. Keep your machine in the field longer with ProGear spindles.